I can hardly believe that another festive season has arrived. 2014 has flown by. At this time of year I often find myself in a reflective mood, looking back at what has happened in the last 12 months and looking ahead, anticipating what a new year might bring. 2014 has been a challenging year for many people in South Ayrshire. Some people have struggled financially and have had to rethink how they live their lives. I spend lots of time with people from communities across South Ayrshire, many of whom are facing such hardships. I can honestly say these are the most generous people you could meet. Christmas is a time for giving, and I find often that those with the least give the most. They are often the first people to step forward and offer to help others. It may be to do voluntary work for a charity, pop in on a neighbour, get shopping for someone when they are ill, support the vulnerable in our society or simply sit and have a cup of tea and listen to others who need someone to talk to. The old saying “It is better to give than to receive” is certainly alive and well in South Ayrshire. Our Council employees certainly believe in giving. Throughout the year they have generously supported our eight Council charities: Ayr Housing Aid, Chernobyl Children’s Lifeline, Gardening Leave, PDSA, RNLI, Riverside Church Care and Share, Seascape and South Ayrshire Women’s Aid. I recently had the pleasure of presenting a cheque to each of the charities for £250. 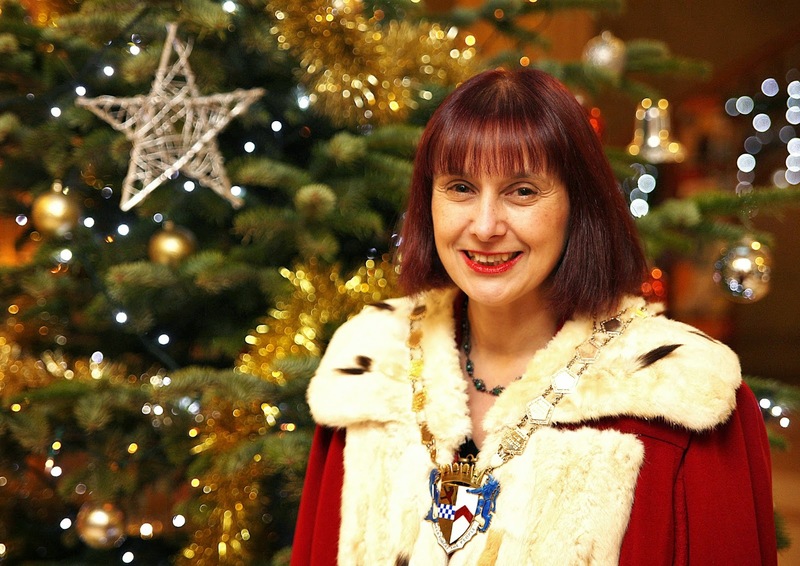 I am very grateful to all Council staff who have contributed to the Council’s charities. There were many highlights in 2014 and for me all of them came back to one thing, great people. I was proud to participate in the Robert Burns Humanitarian Awards which is a globally respected honour bestowed annually on a group or individual who has shown selflessness and dedication in a bid to save, enrich or improve the lives of others through the protection and promotion of human rights and work to deliver social reform and is named in honour of Scotland’s son, Robert Burns. Another big event in Ayrshire was the Ayrshire Hospice 25th anniversary. Everyone in Ayrshire knows of a neighbour, work colleague, friend or family member whose life has been enriched by the people they have met at or through the Ayrshire Hospice. The Ayrshire Hospice team always seems like one big family, a family that is greatly valued throughout Ayrshire. This year our Council, along with East and North Ayrshire Councils, formally marked national Armed Forces Day in South Ayrshire, particularly poignant in this the 100th anniversary of the First World War. This was a time to acknowledge the men and women who have served or are serving their country and to thank their families for the sacrifices they make too. Our wider Commonwealth family paid us a visit this year with the Commonwealth Games being hosted in Glasgow, and we participated in Fly-a-flag for the Commonwealth in March which publicly and collectively allowed us to celebrate the continuing success of the Commonwealth. The Queen’s Baton Relay was the curtain raiser to the Games and came to South Ayrshire in bright sunshine, receiving a warm welcome from our local communities. What shone brightest for me that day was the way in which baton bearers of all ages enjoyed the event making us all proud of them and their role in this once in a lifetime event. We then welcomed Team Ghana for a three week Pre-Games Training Camp. They were warmly welcomed by the people of South Ayrshire and local sporting clubs were fantastic in offering training sessions and support with equipment. Strong friendships were formed between Ghanian and South Ayrshire sports men and women. Getting young people involved is important and again reflects the notion that to give is better than to receive. Earlier in the year I was very pleased to preside over a mock South Ayrshire Council meeting, which young people from our schools took part in. This gave them a true insight into how their Council debates, questions and considers items before making decisions, it brought the Council to life for them. Not all young people have such opportunities and I was particularly humbled when I met ten young girls from Chernobyl who visited our Council headquarters. Once again our employees willingly donated lots of gifts for the children. These are children who are glad to receive toothpaste, socks, combs, underwear, pyjamas and other things that we all take for granted. Life can be difficult for many but the warmth and generosity of people in South Ayrshire never ceases to amaze me. In my role as Provost, it has been my pleasure to meet many people who work so hard in their communities and for the benefit of others, Victim Support, Gardening Leave, VASA, Rotary International to name but a few. However you choose to spend your time during the festivities I would ask you all to spare a thought for everyone who will be working over the Christmas season such as our charities, the police, fire brigade, NHS, Council workers and many more. These people will carry on working as normal delivering services to communities across South Ayrshire and beyond. The people I meet keep me grounded and help me appreciate the important things in life, family, friendship, friends and my community. My wish for you all is to enjoy the festive season and that in 2015 you are contented and you find fulfillment in your lives.